Happy Sunday! Hope you all enjoyed the weekend. The snow seemed to hold off but it’s still in the forcast for this week so stay tuned. We have a busy one so please read the information below. Professional Development Day: A reminder that this Friday is a Professional Development Day for staff. Students do not attend school. Spirit Week Feb 11th-14: It’s here! Monday – House Colour Day, Tuesday – Zombie day, Wednesday – Crazy Hair Day, Thursday – Valentines Colours Day. Rec Leaders will come around to count 5 points per participant, not piece, because red and blue are way too easy to wear. Severe Weather/School Closure Procedures: With snow in the forecast this week, it’s a good time to remind our families that information regarding school closures is always posted on our website (hdsms.sd35.bc.ca) as well as the district website (sd35.bc.ca). We will also share out information through our normal channels of communication … email, Facebook, Instagram, Twitter and the Remind texting app. Please be sure you are plugged into one of those as well. Aboriginal Family Gathering: We are proud to once again be hosting the District Aboriginal Healthy Balance Family Gathering on the afternoon/evening of February 22nd. All the details are her in this flyer (click here). All staff, students and families are invited. 10 Way To Survive The Zombie Apocalypse: It is time for H.D. 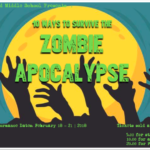 Stafford’s production of “10 Ways to Survive the Zombie Apocalypse” by Don Zolidis. Strap in and hold onto you brains for this public service announcement on the best techniques for surviving in a post-apocalyptic world with zombies, survivors, and everyone in between. Bring a friend or a family member… They may make good fodder for your getaway. General Admission, Student Pricing, and Family Rates are going to be available for cash at the box office during the lunch period.